What do you think? Nice little lady, yeah? She was skinnier when I first got her 2 months ago. How old do you think she might be? Guestimates welcome! She's very pretty! Hard to guess on the age, since she was underfed - but I'd say around a year old? Have you weighed her yet? Last edited by Lolo76; 09-26-2012 at 11:46 PM. It will be really hard to determine age because she's a rescue. I rescued a female normal back in July. 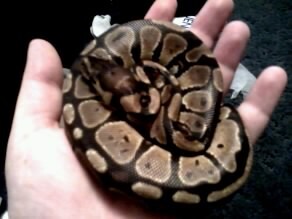 She was 6 months old (from the "breeder") and only weighed 44g...she looked like she had just come out of the egg. Your snake is probably under a year old, but it would be hard to really pinpoint exactly how old she is. No clue on age, but would like to see a better picture of it's head. It looks like it has a line on the back of it's head.